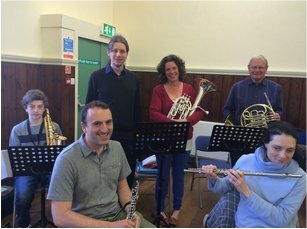 In 2015, the Jan Modelski Orchestra was chosen as one of only 6 orchestras and ensembles from across the UK to be part of the prestigious 'Adopt A Composer' scheme.The scheme is run by Making Music in partnership with Sound and Music (the national agency for new music) in association with BBC Radio 3. This was truly a great accolade for all of us and the following is a brief history of the exciting events that followed. 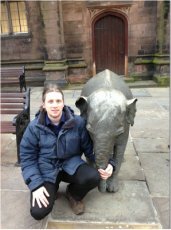 To hear 'Janya', the piece Chris created for us, click here. 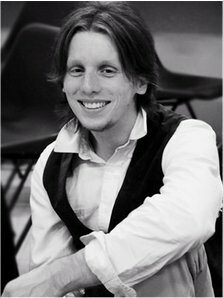 Chris will be working alongside "mentor" David Horne, Composer and Senior Lecturer at RNCM Manchester, to compose a piece specifically for JMCO. 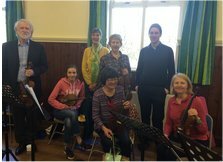 A great turnout at this week's rehearsal when we welcomed Chris, our Adopted Composer, for his first visit to hear us "live". As we played and practised Chris mingled and moved around the sections to get a sense of how we sound. He also chatted with a lot of players at the break to get to know us. Wow!! 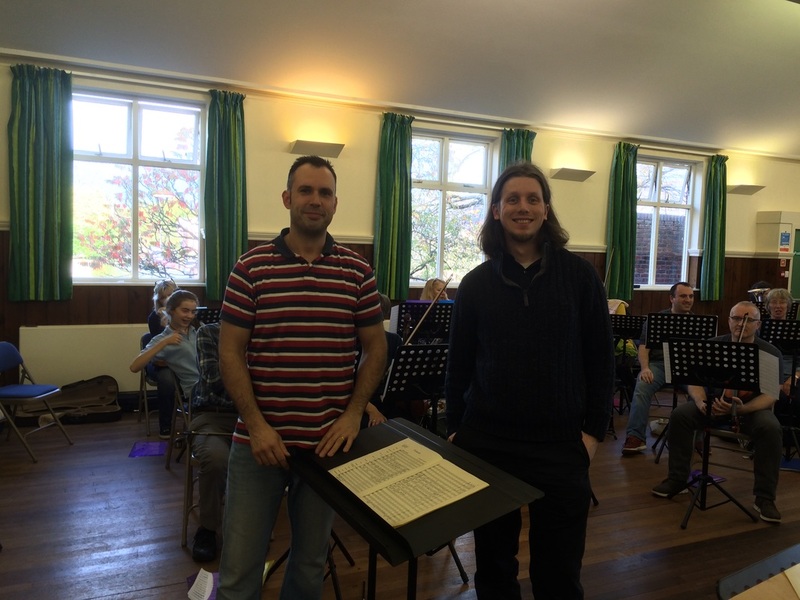 What a great rehearsal on 5 December with Chris Hutchings, our Adopted Composer. 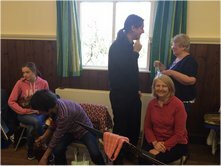 Chris had prepared parts for all to try out and introduced us to interesting new ways of making sounds and music! Although we look a bit serious in the photo, we did have a lot of fun. Chris thought it went well. Poor Chris, wife and baby daughter had horrendous journey back to Edinbugh because of floods. Ended up in York for the night. They were relieved to get home to recover. 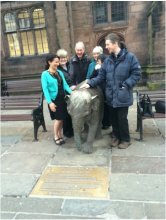 However working with us and seeing the real Chester elephants at the zoo compensated for their troublesome journey!. Looking forward to next workshop in February when Chris will have developed his ideas! Chris arrived for the workshop full of ideas and energy in spite of having to travel by bus from Edinburgh to Lockerbie. The day was even more special with FOUR FRENCH HORNS playing! 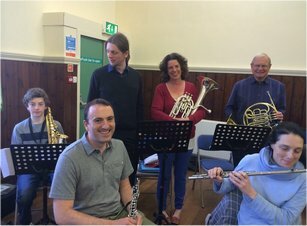 Chris has risen admirably to the challenges of our orchestra i.e a wonderful mixture of instruments, including 5+ clarinets and 5+flutes with saxophones various. 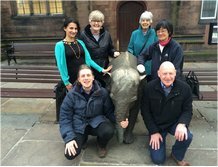 As the session progressed we were able to appreciate how the sounds we made were telling the story of the birth of an elephant, his growth and development and adventures in a forest as Chris explained. 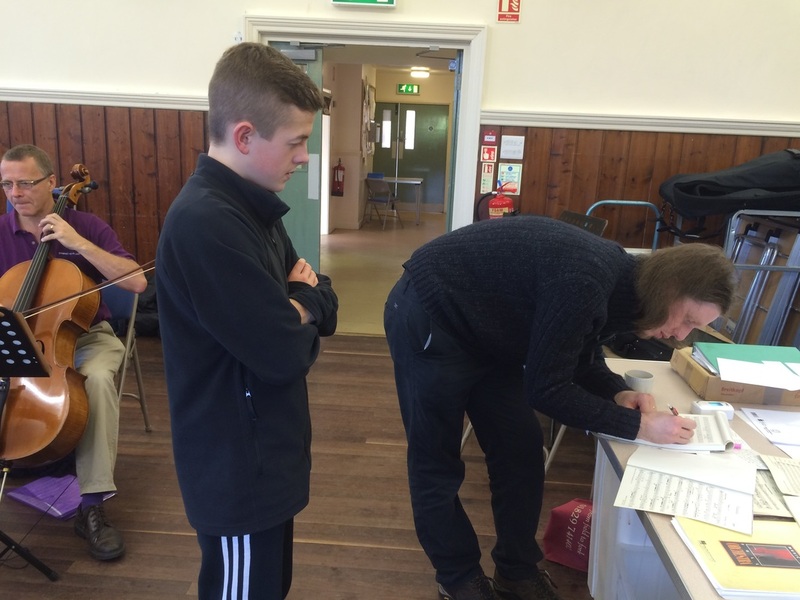 Chris was accompanied by our mentor David Horne who was heard to say how much he liked our venue Barrow Village Hall. 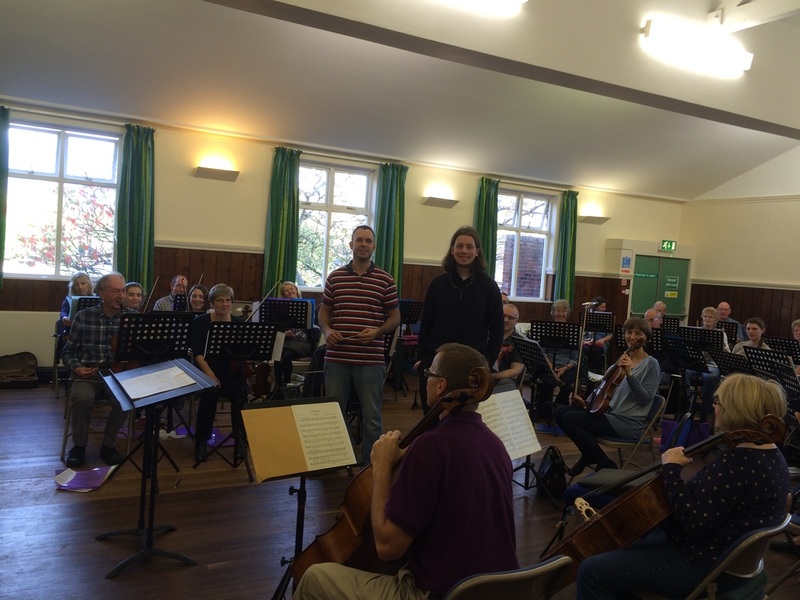 Photos of Chris Hutchings' visit to our rehearsal in Barrow and to trip to see Janya in Chester. SUMMER CONCERT 9th July 2016 - What a success!! 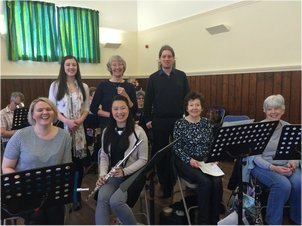 The Jan Modelski Orchestra performed the World Premiere of 'Janya' by Chris Hutchings at Caldy Valley church in Chester. The piece was well received by a large and appreciative audience at Caldy Valley. Radio 3 were there to resord it and it will be broadcast in the New Year 2017. If you want a sneak preview, go to Chris Hutching's Facebook page. 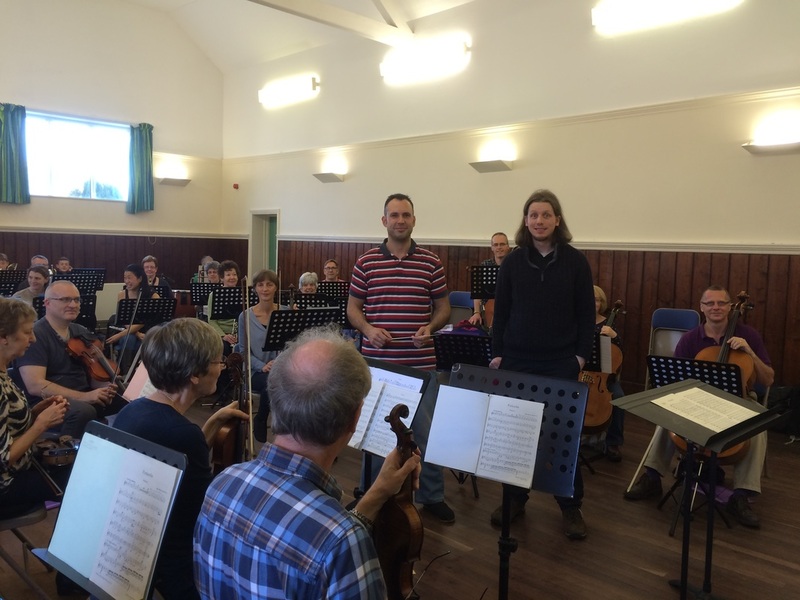 What a fantastic experience for an amateur orchestra! Adopt a Composer is run by Making Music in partnership with Sound and Music (the national agency for new music), in association with BBC Radio 3, and funded by PRS For Music Foundation. 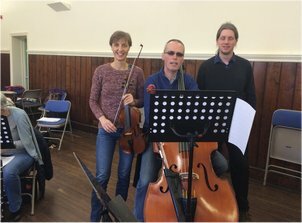 It works exclusively with composers at the start of their careers, giving them crucial ‘real world’ compositional experience, as well as guidance from established mentors – Colin Riley, Fraser Trainer and David Horne.